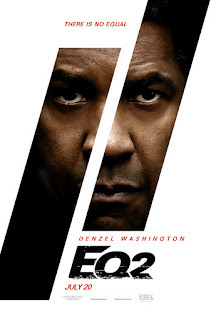 Denzel Washington reprises his role as an off-the-grid ex-CIA operative, presumed dead. He's a vigilante with morals, who tells his victims in advance why he plans to kill or hurt them. The character's strong like Dirty Harry in the 70s. The script takes the usual path, good men and women killed by those gone over to the dark side. The story includes a former partner gone rogue, and a fight to the finish during a hurricane. Washington's presence is so strong, he manages to rise above the material. "The Equalizer 2," rated "R," 2 stars. Does it deliver what it promises? Good versus evil, and good wins. Is it entertaining? Strong Denzel performance. Is it worth the price of admission? Look for it as the in-flight movie soon.